My story recommendation of the week is "Mister Oak" by Leah Bobet, a short story from the February 2010 issue of the recently revived Realms of Fantasy. Leah Bobet becomes only the fourth author to receive two different story recommendations on this blog, joining Paolo Bacigalupi, Catherynne M. Valente, and Aliette de Bodard. "Mister Oak" is the whimsical yet bittersweet story of a tree who falls in love with a woman. It is certainly the best story told from the point of view of a tree I have read since "Direction of the Road" by Ursula K. LeGuin. Actually, it's the only story from the point of view of a tree I have read since "Direction of the Road," but I just put Bobet's name in a sentence with Ursula LeGuin -- is she likely to complain? It's nice to see Realms of Fantasy has come back strong under its new ownership. 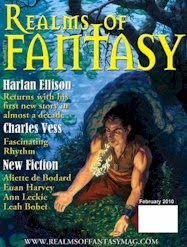 In addition to "Mister Oak," the February 2010 issue features a new Harlan Ellison story and tales by several up-and-coming authors including Bobet and de Bodard. Since 2007, Hub Magazine has been posting fiction, reviews and features on nearly a weekly basis. It only publishes one piece of fiction per issue, but it has topped one hundred issues already, so that adds up. In 2009 alone Hub published such notable authors as Colin Harvey, Mari Ness, Philip Palmer, Sarah Pinborough, Andy Remic, and Ian Whates, among many others. When Aname told me about her child to come, she spoke of a bargain struck. And thus I should have known someone would come to honour it--that someone would walk through the rice paddies and the forests until he reached our jati, our small community isolated from the affairs of the world. But, just as you know about death but do not think about it, so I did not think about him. Daya resolves to defy the blood empath, believing she acts out of protective instincts toward the child. The girl has been tormented all her life as "fatherless" by their jati, and finds it difficult even to accept a small gift from her father, for fear someone will take it from her. But ultimately it is Daya who cannot bear the thought of a gift being taken away. In the past few months I have read four stories by Aliette de Bodard, all of which are beautifully written. De Bodard clearly has a marvelous writing career ahead of her, and I am greatly looking forward to her first novel Servant of the Underworld, recently published in the UK and forthcoming in the US from Angry Robot Books. But the oddity to me is that of her four stories I have read recently, the two I found most powerful were published in small e-zines, "By Bargain and by Blood" in Hub and "Blighted Heart" in Beneath Ceaseless Skies. The two stories that appeared in major print magazines, "The Wind-Blown Man" from Asimov's and "Mélanie" from Realms of Fantasy were also well-written but to me carried less impact. I do not know if de Bodard offered "By Bargain and by Blood" and "Blighted Heart" to the major print magazines (they would be too heavily weighted to fantasy for Asimov's, and it's possible she wrote them while Realms of Fantasy was out of commission), but it seems odd that two such superb stories did not find a higher profile home, and I suspect it may be because they are more understated in their use of genre tropes than Mélanie and The Wind-Blown Man. I am beginning to wonder if the major SF/F print magazines have become too concerned with finding fiction that fits a certain marketing niche, rather than just printing the best stories they can. 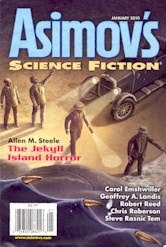 This week's story recommendation is "Marya and the Pirate" by Geoffrey A. Landis, a novelette from the January 2010 issue of Asimov's Science Fiction. Some readers complain that nobody publishes the kind of fun space adventure that was the bread and butter of science fiction in the 1950's. The trouble is that all those stories were published in the 1950's, and it is awfully difficult to write a story like that today that doesn't feel stale. Geoffrey Landis pulls it off in "Mary and the Pirate." Like a Murray Leinster story of old, it begins with a space pirate closing in on a transport ship carrying a very valuable cargo into Earth orbit. Later, the pirate and his captive face a problem of inexorable celestial mechanics, reminiscent of Tom Godwin's "The Cold Equations." But Landis manages to add enough new twists and details and modern sensibility to keep it all fresh, and not just a pastiche of old-style skiffy. Among his many awards, Geoffrey A. Landis has garnered two Hugos and a Nebula. His output has declined in quantity the past few years, but not at all in quality.